Posh assistant manager Grant McCann. Posh assistant manager Grant McCann is happy to stay on the sidelines this season. McCann joined Posh as a left-footed midfield wizard in 2010 and he has been a star man on the club’s promotion and relegation roller-coaster ever since. He quickly became a firm fans’ favourite thanks to his vision, commitment and set-piece brilliance. 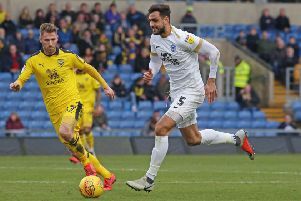 The former Northern Ireland international will never forget the fantastic playing days at Posh, but he now busies himself with adjusting to life on the touchline. McCann, who can get frustrated when his own high playing standards are not matched by the players in his care, said: “I am really looking forward to my first full season as an assistant manager. The players are ready to go and hopefully we can make a good start against Rochdale. “I started my coaching badges over five years ago as I could always see myself heading in that direction once I finished playing. “Over the last five years at Posh I have learnt plenty from different managers, some good bits and some bad bits which has put me in good stead for the position I am in today. The Posh journey began for McCann in 2010 when new manager Gary Johnson asked him to provide quality to a team just relegated from the Championship. McCann added: “I could have remained in the Championship with Scunthorpe, but I knew Peterborough had the potential to go straight back up with the likes of Craig Mackail-Smith, George Boyd and Lee Tomlin in the side. It worked well enough for Posh to win promotion and McCann played a major role in the play-off successes over MK Dons and Huddersfield. “The penalty I scored at MK was vital.” McCann added. “But it shouldn’t have been a penalty because it was about 10 yards outside the box! We got a bit of luck and I was in no doubt that we would beat them in the second-leg tie at London Road because we were going so well at the time. “The feeling amongst the side before Old Trafford was just excitement and we finally took control in seven magic minutes towards the end. And I was lucky enough to set the first goal up before scoring the third goal. However, times haven’t always been plain sailing at Posh for McCann who was placed on the transfer list in 2012. He also vividly remembers every fans’ nightmare afternoon at Crystal Palace when two late goals condemned Posh to relegation to League One on the final day of the 2012-13 season. “Crystal Palace away was by far and away the worst memory of my time here. “When Palace got their last-minute free-kick I remember saying to (Palace defender) Damien Delaney ‘don’t put it in the box because you’re in the playoffs and we are safe’, but then someone else took it and it was devastating when they score. I’m just glad that time has passed and we can just look to the future. “I hope that I can become a manager one day, but I’m not thinking too far ahead. “ I am fully focussed on the season that lies ahead and getting this club back to where it belongs and not only staying there but progressing.